Given a grid of with N rows and N columns, with special square grid of size K imes K in its center, and position of M snakes (vertical of horizontal segments of consecutive cells), where no snakes are inside the special square, the task is to leave minimum number of snakes on the grid (remove the maximum unnecessary snakes), so that the special square will be protected by the remaining snakes. 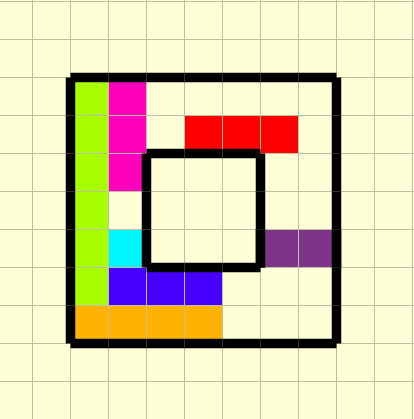 The special square is protected by the snakes if and only if there doesn’t exist an arrow that can be shot along a row or a column, which can enter the special square and leave the whole grid on the other side. Notice that arrows can pass only cells not occupied by snakes. We say that a snake protects a side of the special square if and only if there exists an arrow that can be shot as described in the statement and the snake prevents it either from entering the special square or leaving it on the other side. The first thing to notice is that there is no snake which can protect both a vertical and horizontal side of the special grid at the same time. This is true because snakes are straight segments. Thus the problem can be divided into two separate problems: finding the minimum number of snakes required to protect horizontal sides of the special square and finding the minimum number of snakes required to protect vertical sides of the special square. We’ll focus here on the first of these problems because the solution to the other one follows the same idea. We reduced the original problem to a problem of finding the smallest subset of the given set of horizontal segments S, which covers completely the whole segment A. This is one of the classical problems, which can be solved greedily. The idea is to sort the segments in S by their left endpoints and process them from left to right in that order trying to cover the left-most not yet covered point of A. More specifically, let’s assume that x is the left-most not yet covered point of A. We examine all segments from S with left endpoint not greater than x and we take to the result the one with the largest right endpoint. Let this largest endpoint be k, so we update x to k+1 and continue the process until either all points of A are covered, so we have the result, or we examined all segments, which means that there is no way to cover A. The total complexity of this solution is O(N \cdot \log(N)) and it’s dominated by sorting time. Notice that we need to solve this problem two times: one for horizontal sides of the special square, and second, for the vertical sides of the special square. If at least one of these problems has no solution, we, of course, return -1 as the final answer. @pkacprzak Hey, how can we keep track of the points that have been covered, or not yet covered? In my solution I tried using an array of all ‘k’ points. I do the same for both horizontal and vertical points that need to be covered. but ‘k’ can be of the order (10^9)-2. I am getting a TLE. Can you suggest a better way? I did something like this only, but maybe some cases are not passing , can you give me some cases? Hey I used similar logic,but got wrong answer would you help me? @durden8055 . Have a look at this test case, actual answer should be “2” but your code displays “-1”. @abhi98, got the mistake, thanks !! I also did the same thing as mentioned in the editorial. Still I was getting WA. I can’t figure out what’s wrong with my code. Can anybody provide a strong test case or debug my code please? @namenotfound15 Try this case. It should output 3. Can anyone tell what’s wrong here? Tried almost all test cases. Can someone suggest a testcase for which this fails?? The solution links given with the editorial get directed to some error page. @admin Please look into this. Thanks ! Can someone please help me in showing where I am going wrong. Its giving WA. I have tried it with the test cases, given in the comments, by @paphonb and @abhi98. It is giving correct answers. Please help. Thanks ! check this test case.output should be 3 but your code is giving -1. @aniruddh48 Thanks for replying. Can you please look at the provided test case by you. There are 7 snakes given the first line of input. But it is followed by only six snakes. Please look at it. @aniruddh48 Thanks buddy. I got it what you are pointing to. @paphonb Got my mistake. Thank you so much! Can anyone post the correct solution here. Anyone please tell what’s wrong in my code.